The present chapter looks at the Islamic understanding of wellbeing, the good life for the one living it, as reflected in the Quran and the themes commonly recognized in modern Muslim scholarship. The chapter discusses historical and contemporary Islamic interpretations of wellbeing, revealing only slight differences. It also explains how Islam advises one should live in order to achieve wellbeing. 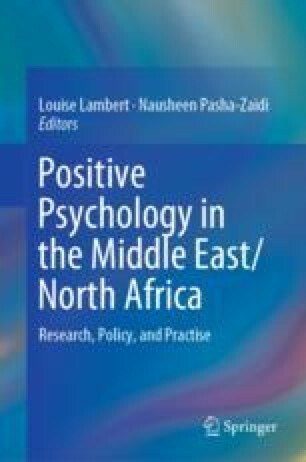 Finally, Islamic conceptions of wellbeing are compared to Western ones, revealing that, despite starting out with a similar religious focus, Western views of wellbeing have become much more centered on subjective happiness than Islamic conceptions. Aquinas, T. (1955–1957). Contra gentiles. J. Kenny (Ed. ), A. Pegis, J. Anderson, V. Bourke, & C. O’Neil (Trans.). New York, USA: Hanover House. Retrieved from http://dhspriory.org/thomas/ContraGentiles.htm. Ianchovichina, E., Mottaghi, L., & Devarajan, S. (2015, October). Inequality, uprisings, and conflict in the Arab World. Middle East and North Africa, Economic Monitor. Washington, DC: World Bank Group. Retrieved from http://documents.worldbank.org/curated/en/303441467992017147/pdf/99989-REVISED-Box393220B-OUO-9-MEM-Fall-2015-FINAL-Oct-13-2015.pdf. Khaishgi, A. E. (2016, March 20). ‘Happiness is a serious job’: UAE’s Minister of Happiness embraces new role, The National. Retrieved from https://www.thenational.ae/uae/government/happiness-is-a-serious-job-uae-s-minister-of-happiness-embraces-new-role-1.201750. Pew Forum. (2011). The future global Muslim population: Projections for 2010–2030. Washington: Pew Forum on Religion & Public Life. Retrieved from http://www.pewforum.org/files/2011/01/FutureGlobalMuslimPopulation-WebPDF-Feb10.pdf. Pew Research Center. (2012). The world’s Muslims: Unity and diversity. Retrieved from http://www.pewforum.org/files/2012/08/the-worlds-muslims-full-report.pdf.